The stunning Italian island of Sardinia has long been a coveted tourist destination -- thanks to its miles of spotless sandy beaches. If you visit Sardinia and fall under the island's spell, you might want to take a slice of the isle home with you -- but if you're thinking of pilfering a pocket of the shoreline's golden grains, you should think again. 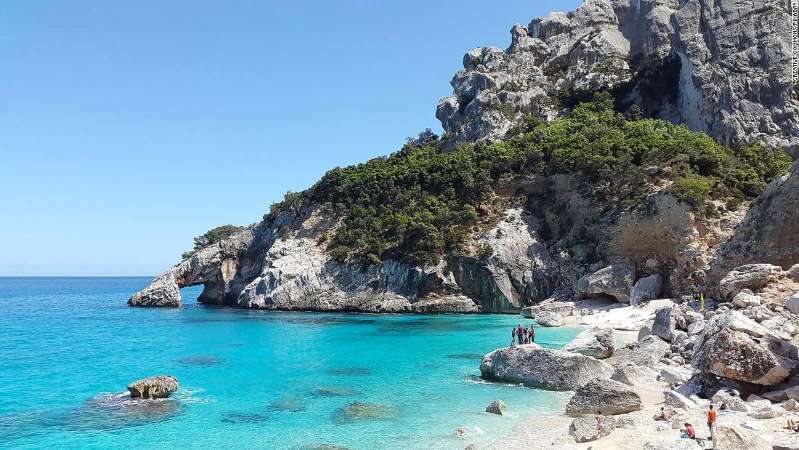 This week a tourist, Naples-born but resident in the UK, was fined the equivalent of more than $1000 when authorities discovered that the visitor had stolen sand from a beach near the Northern city of Olbia, according to local paper L'Unione Sarda. Sand thieves are now being warned that they could be fined anywhere from €500 (roughly $580) to €3,000 (roughly $3,482) if they are caught with sand, pebbles or shells taken from Sardinia's beaches. [post_ads]Tourists may not be aware of the severity of their crime when they fill a bottle or plastic bag with sand and take it home. But in recent years, authorities in Sardinia have cracked down on sand theft and are stressing the consequences of this robbery. The German Embassy in Rome posted a warning on Facebook to those potentially considering stealing sand, explaining it causes "significant damage." Beaches have clear signs warning that these offenses will not be tolerated. Sand thieves are usually spotted at airports, where customs officials can search bags or the sand might get picked up by airport scanners. A local Facebook page, "Sardegna Rubata e Depredata" -- translated as "Sardinia, robbed and plundered" -- campaigns against the pilfering of Sardinia's beaches. The page was created by a group of security inspectors from Sardinia's airports. "The purpose of the page is to raise public awareness about this problem," one of the page administrators tells CNN Travel. "During the last 20 years of activity we have seized tens and tens of tons of material [...] Every year we take care to bring everything back to the places of origin at the end of the summer season." The administrator voices concerns about the effects of overtourism on the island. "Sardinia could easily live only for tourism but unfortunately the regional politicians are not in the least able to protect and enhance the natural resources of Sardinia." "Taking away even a single bottle of sand in memory of the holidays makes the patient and long work of nature in vain," adds the administrator. "So if you come on holiday in Sardinia remember to take photos, observe the magnificent nature, listen to the sounds, smell the scents of nature, keep the memories in your mind but do not take away because it does not belong to you but belongs to everyone." Locals and authorities are keen to find a balance between encouraging tourism and discouraging theft. On the Sardininan island of Budelli, La Spiaggia Rosa -- a beautiful beach colored pink thanks to the local microorganisms -- has been cordoned off since the 1990s to protect its blush-colored sand from erosion due to tourism. Budelli's sole resident, Mauro Morandi -- a former recluse who has become an Internet sensation thanks to his Instagram account which showcases his photographs of the island -- spoke to CNN Travel earlier in 2018 about protecting the islands beaches. According to Morandi, showing visitors the beauty of the beaches helps protect them. "I am very satisfied with my visibility, because I think it can help to appreciate the beauty [and] therefore the respect and protection of nature," he said.